India is running its post colonial democratic practices for the past 67 years. It may not be the best in delivery of government services to the public satisfaction. Yet it goes on superbly in its election processes and the government formation. Year by year there is a vast improvement in the electoral system. Despite loud noises about its darker side of democracy, India marches ahead brilliantly. This is what can be seen as the beauty of Indian democracy. Arrogant political parties and persons are tamed through the ballots. The political personalities are finding it extremely difficult to predict the voter moods. Hence they start working carefully to satisfy the public. The caste arithmetic, coalition with other political parties, bribing the voters, freebies announced prior to the elections are some of the many tricks adopted to win voters. But the voters are so smart that they change the representatives which they are not satisfied despite all the attractive offers they get. 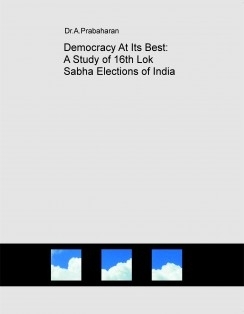 This book studies the 16th Lok Sabha elections in details with the complete list of candidates in all 543 constituencies.